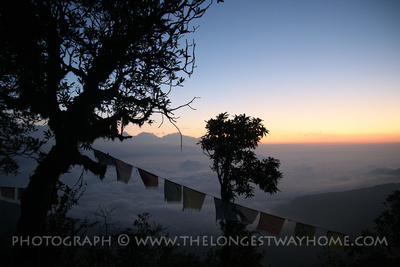 Looking for a short budget trek with great views of the Annapurna region? Here's what I found! The Panchase trek or Panchase Peak trek is located very close to Pokhara in the Annapurna region. It's an age old local trekking and panorama viewing route that doesn't require any permits and is relatively well marked. A pleasantly enjoyable low altitude trek it takes you up through a forest area, through rich farmlands, back through forests and up to several look out points. 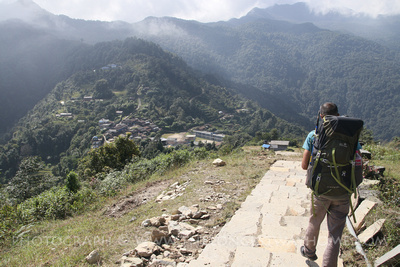 This is a teahouse trek with at least three villages you can stay at on the way. 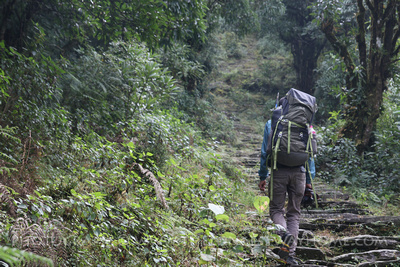 The Panchase trek can be completed between 2-3 days depending on your requirements. 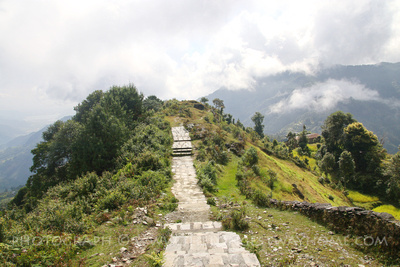 Panchase is an ideal trek for those who want to test out their trekking abilities before going on a longer trek. For those looking for a nice short trek. Or For those looking for a budget trek. Read on to learn more about this great "panoramic trekking trail". Please note: the maps on this page are not to be used as physical trekking maps to Panchase, they are here only to show the rough outline and show the region of the trek. Distance shown is a return trek. A fully detailed guide to Panchase with more details is below. Honesty counts! Every travel guide on this site has always been 100% independent, unbiased & honest. I do not accept sponsorships, free treks or tours. I do not own a trekking company or business in Nepal. I pay my own way & in turn write authentic guidebooks to Nepal. Rest assured, this is a genuine travel guide that you can trust. » How to arrange a trek to Panchase? » Best time of year to go trekking to Panchase? 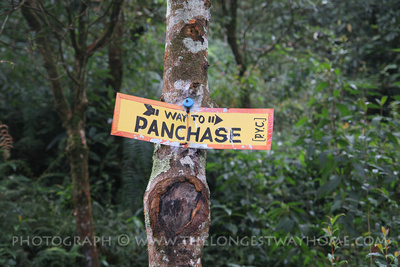 » What do I need to go trekking to Panchase? » How fit do I need to be to go trekking to Panchase? » What's the food like on the Panchase trek? » What's the accommodation like on the Panchase Trek? » How difficult is the Panchase trek? » How much does a Panchase trek cost? Where is the Panchase trek? Panchase is located to the north-west of Pokhara's Lakeside area. Technically it's possible to drive nearly all the way to Panchase but the road is bad and you can bypass it when trekking. The Panchase trail is well marked on the way up, but on the way down it is not. 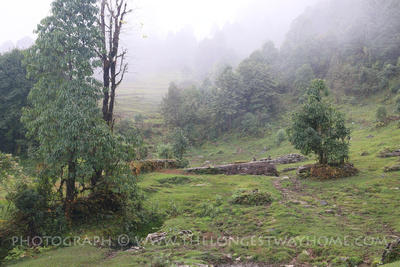 The trek route starts like many other in Nepal along the dirt road. However after only an hour you reach a lush farmland area along a ridge. This is where the real trekking begins. You make your way through pristine forest along stone steps, forest paths and grassy hills. Quite farmhouse and buffalo sheds dot the mountainside and you'll encounter friendly locals. With good weather you see the valley's bellow as you make your way up to around 2,000m where you can stay the night in a town called Bhadaure. The next morning you can trek up to Panchase itself for a great sunrise view. At 2,500m Panchase peak is relatively low in altitude but it does offer great panoramic views of Macchapuchare, Dhaulagiri, Annapurna, Lamjung and Manaslu. There are several look out points available to see these mountains which we'll cover here. It's also possible to stay at Panchase peak however it's more comfortable to stay in the village below. This map shows you the most popular Panchase trekking route. Please note this map should not be used as a practical trekking map. While the main Panchase route remains the same there are variations depending on side trails, the road, weather conditions, time of year, natural events and physical changes to the trek paths. Detailed trekking maps can be obtained in Nepal at very low costs. The Panchase trek is a well known area. However most facts are less certain in regards to the many "trekking routes" to or back from Panchase. At 2,500 meters (8,202 ft) Panchase Peak marks the highest point of the Panchase Trek. The highest sleeping point along the Panchase trek is at the very top of Panchase Peak which is 2,500 meters (8,202 ft). However better accommodation is available at Bhanjyang at 2,000 meters (6,561.68 ft). How long have people been trekking the Panchase route? The Panchase area has always been a popular local area. The route was once a camping only area. In the past decade teahouses have opened up in the hope that the area would become popular. Trail signs were places along the route going up but none on the way down. Since 2015 the road development has taken priority. However the trails easily divert around the road still making it a pleasant route. Trekking permits have never been needed for Panchase. That's not to say they won't ever be required. It's likely if the road is ever completed then Panchase will popular with day trekkers and an entry fee eventually come into effect. What mountains can you see from Panchase? Panchase has panoramic views of the Annapurna mountain range from the top. In particular Macchapuchare (6,993 m), Dhaulagiri (8,167 m), Annapurna (7,010 m), Lamjung (6,822 m) and Manaslu (8,156 m). These are best seen at sunrise. However, early mornings can also have great views. On clear days the views can be seen in the afternoon. 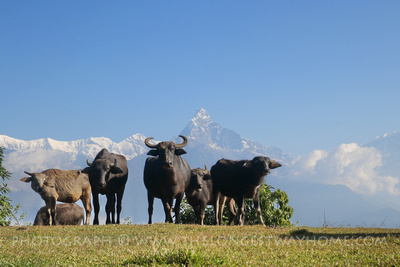 There are many options for a regular trek ranging from package tours to independent trekking. Booking online is not recommended for this trek as it can be very expensive. Treks to Panchase can easily be arranged in Pokhara. Package tours to Panchase bought online usually have additional days added on to them. Most of these "extra" days are not necessary and are only placed onto the trek to bump up the price by using guide fee days. Package tours usually include food, porters and accommodation. Pro's of an online package tour is that everything is done for you ahead of time. Con's include it greatly increases the cost of the Panchase trek which doesn't really have to be booked online. 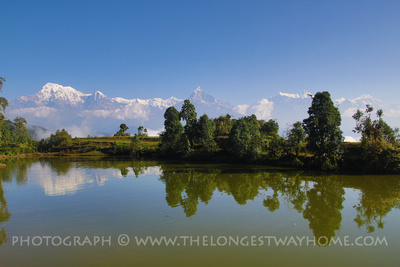 You can basically arrange a guide on the same day you leave Pokhara should you wish. If you want to buy a package trek to Panchase when in Nepal, then do it from Pokhara and not Kathmandu. You can easily arrange a package trek along the Panchase route yourself. If you have time then try to visit a few trekking agents to compare prices. Permits are not required so basically all you need is a guide, accommodation and food. Trekking agents tend to pass off new guides for this trek as it's not very profitable for them. Do make sure you are comfortable with your guide before agreeing on anything. Ensure that you understand what's included in the total price of the trek. This should include accommodation, food, bus/taxi fees etc. There are no flights involved with the Panchase trek unless you are coming from Kathmandu to Pokhara (where the trek starts). You could break down your package trek just for a guide, transport and accommodation. Looking after the food yourself. Just remember its protocol when trekking to eat where you stay. Pro's with a package trek include meeting your guide before hand and being able to talk or ask questions in person. Buying a package trek from Pokhara to Panchase is much cheaper than online. Con's include trekking agents trying to add extra days to the Panchase trek. At best the trek is 3 days. However many will include "side treks" to other villages. These are the types of villages you'll encounter on the 2-3 day trek anyway. During the busy peak seasons you may also find it difficult to find a qualified guide who has the time for such a short trek. It's just a matter of patiently asking around trekking agents. Perhaps the best option for Panchase is to hire an independent guide yourself rather than a paying extra for a package tour. It's a very short and uncomplicated trek so there really is not need to pay over the odds for an all inclusive package trek. If you go with justa guide then you'll need to pay for accommodation and meals yourself. This is not hard as the reality is you only have about 5 tea houses to choose from. Menu prices are fairly set too. Pro's with just having a guide include saving money and being more independent. Con's include having to deal with a the odd rogue teahouse owner who may try to overcharge. In this case, you just walk next door to the next teahouse. Lastly your could try trekking to Panchase yourself. The route is fairly well marked out on the way up. However if you elect to come down a different route then the trail is not marked at all. Naturally if you've never trekked before or are not used to the outdoors it's safer to take a guide. Pro's here include independence and a very low budget. Con's include having to navigate the trail yourself and deal with teahouse owner. It's important to note that people have had accidents and become lost coming down from Panchase using unmarked trails. The often mentioned "world peace stupa trail" should be avoided due to lack of use, no markers, places to buy water. Please note: Some rogue online and even local trekking agents will try to include the cost of an Annapurna Conservation Area Permit and TIMS onto the trek. These are not needed. If a guide insists and you are still happy to go with them then make sure you actually see your permit and TIMS card. If looking for a guide for the Panchase Trek I recommend you read my article on How to find a trekking guide in Nepal. You may also contact me if you wish to have my personal recommendation however it would be appreciated if you purchase one of my guidebooks as they also list my recommendations and keep this site going. Panchase is open year round. However it can be one of the wettest areas in the Annapurna region. There are peak seasons which suit this trek and the following months have traditionally been used as a guide for preferred times of the y ear to do the Panchase trek. Mid Sept-October - November/(early)December: this is Nepal's peak and best time to go trekking however if the Monsoon is late then Panchase can remain cloud covered until mid October. Otherwise the views at this time of year in Panchase are usually very good. February-March-April: this is the end of the dry season and the second best time of year to go trekking. However, if there is rain fall in Pokhara then Panchase is likely to have cloud cover. November/December to January/February: the skies are quite clear but it can get cold in Panchase. There is however little chance of snow in Panchase. Do however be careful of ice on the stone steps. May - June: This is Nepal's hot pre-monsoon season and it can get quite warm. The valleys around Panchase are starting to bloom with flowers though which makes for a very nice trek. However cloud cover can be an issue. June - Mid September: this is Nepal's Monsoon season and not the best time to go trekking to Panchase The risk of leeches in this area is high. Likewise the stone steps are very slippery, downpours also increase greatly. What do I need to go on the Panchase trek? If you take a package tour then your trekking agency will give you a list of things to bring for your trek. They may also supply you some items like trekking poles. Trekking poles can be very helpful when coming down from Panchase due to many stone steps which can be slippery. How fit do I need to be to go on the Panchase trek? Panchase is not a particularly long nor taxing trek. One of the hardest parts is if you do the sunrise walk in the morning which is in the dark, up many steps and takes up to two hours. Keep the following in mind. There about 5200 steps leading up to Panchase Peak. And 5200 coming back down! A certain level of fitness is definitely required however there is no climbing involved. Many people do find the number of steps taxing. Especially when coming down as they can be slippery and extra care is definitely needed. Again, trekking poles help tremendously. Like any trek I would advise anyone going trekking to see a doctor before they go for a check-up and to talk about dealing with altitude sickness. For pure trekking along the Panchase trail you'll need to consider the amount of days you'll be out trekking to get an idea of how fit you should be. The first day takes 2 hours to the first village. Then another 3 hours to Bhanjyang for the night. The next day it's a 2 hour trek up and down to the view point. If you go back to Pokhara as described here then it take about 5 hours going down steps and hills. An entire 3 day trek covers roughly 23 km. Again, the hardest point for many people are the steps. Mainly because they can be slippery and it takes extra concentration and care to navigate them. There is however the nearby road which you could walk along if you find it hard going on the main route. 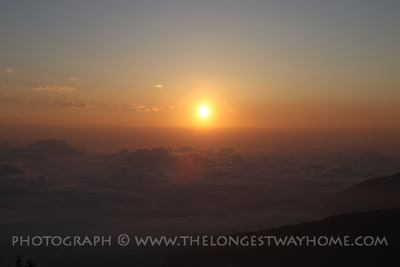 The sunrise trek has no road and it is 52000 steps. Altitude sickness is not really a problem on the Panchase trek as you will only be reaching 2,500 meters. As a precaution do read about altitude sickness in Nepal. Many people from all ages go on the Panchase trek. It's very close to Pokhara so there's no rush. If you go back to Pokhara the way you came then the route is much easier. What's the food like on the Panchase trek? Food on the Panchase trek can be a bit of let down. 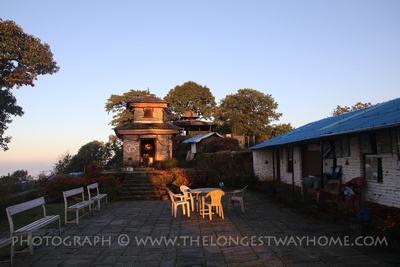 Dal Bhat is the staple meal here followed by typical trekking menu fare like pasta, pancakes and chop suey. The latter options are not that great to be honest and it's best to stick with Dal Bhat. In Bhanjyang many of the tea houses have small gardens to grow fresh vegetables. Meat is expensive and not always available. Breakfasts are hit and miss. Pancakes are not often the same as you might expect on other treks. Porridge is usually available. Bringing some trekking bars can be a great help in Panchase Particularly for the sunrise trek up to the peak. There is a small tea house at the peak but the food is only so so. It might be better to eat a full breakfast back in Bhanjyang. This is the type of Dal Bhat you'll get when trekking. Beer, soda, coffee (Nescafe), tea, hot lemon and water are also widely available at the teahouses. Water filters are not the best at the tea houses. Bottled water or boiling and treating your water is a good idea. There's very little fruit on the Panchase trek. Cheese also seems to be rather dubious due to the wet conditions. Nepali dry beans are a favorite in this area however do be careful as they may not be soaked in clean water. Bringing your own snacks on this trek is a good idea and relatively easy given the short distance. What's accommodation like on the Panchase trek? Accommodation is pretty basic during the Panchase trek. in Bhadaure you'll find a couple of teahouses well advertised near the shrine at the junction. It's a case of checking each one out to see it suites. But that's Bhadaure which is only a two hour trek from the trail head. Most people head straight up to Bhanjyang for the night. In Bhanjyang there are at least 5 teahouses. The most popular is Happy Heart which is run by three sisters. They have several rooms available in a few teahouse style buildings. There's Panchase Resort which is a little pricey for what you get. In the center of the village is Midpoint Hotel which is basic but will do. At the end of the town where the route up to Panchase peak starts is the rather lengthy named Mountain Sunrise Sunset View Hotel and Restaurant. They have basic accommodation along with attached bathrooms and nice views. It's worth checking out each place's beds before deciding. Finally there's a basic teahouse at the top of Panchase peak. It overs simple rooms and food. From the outside it looks nice but again do check inside. Hot showers are not available in all places and depends largely on either solar heated water or gas. Do ask about the cost for a shower. Wifi is not good in Bhanjyang. However NTC mobile network just about reaches there with 3G. NCELL less so but you might be able to find a corner where it works. Read more and see what trekking accommodation is like in Nepal. How difficult is the Panchase Peak trek? There is certainly no need for any technical climbing or even difficult trekking. There are no high passes and it only reaches 2500 meters in altitude. The trails are mainly steps or forest pathways. With little doubt hardest part of the trek are the steps going down if wet. Trekking poles are seriously advised. Likewise do see if your footwear easily slips on stone or not. Some modern trekking boots struggle with wet stone steps. To reach Panchase peak for sunrise will mean living Bhanjyang at around 4.30 am so you'll be trekking in the dark. Head-torches are a must. Leaches during the monsoon season are another problem. So do be careful where you sit en route along the trail. The route back to Pokhara is not marked. If you are uncomfortable with this, then take the same route you arrived by. How much does the Panchase trek cost? Putting a cost on the Panchase trek is relative to your needs. There are no permits, entry fees or TIMS cards needed so you'll already be saving money there. The pristine mountain & forest views Panchase make it a great first time trek or training trek for longer one later! Package tours bought online are without doubt the most expensive for those looking for a Panchase guide. Do be aware of agencies offering 5-9 day Panchase treks. These have many "filler" days just to stretch it out. Package tours for Panchase bought within Nepal are the next most expensive option. Going with just a guide will involve paying for the guide, accommodation and food. Finally trekking to Panchase alone is the cheapest option..
Online package tours of between 3-9 days can cost up to USD$500+ pp. This does not include water. It does include a guide, accommodation and meals. Personally I think this not worth it at all. In country package tours for 3 days can cost $200-300+ pp. This includes a guide, meals and accommodation. This is also expensive considering the type of accommodation and effort involved. If you can wrangle this price for two people then it's a little better. For a guide only service it can cost from $20 to $50 per day. Basically the more you pay, the more experience your guide should have. However, keep in mind this is not a particularly difficult trek so you most likely don't need a high-end guide. Independent costs of going to Panchase make it a very affordable low-end budget trek. Two or more people obviously can share the room price. Something to consider if budget is an issue. You really shouldn't need a porter for this trek. But if you opt for one then their fees are roughly USD$18. Room prices vary between 400 rupees and 1100 rupees depending if the room has a n attached bathroom or not. The cost of one liter of bottled water reaches a maximum of 100 rupees at Bhanjyang. It starts at around 30-50 rupees. The cost of a plate of Dal Bhat starts at around 200 rupees in Bandung and climbs to 400 rupees. Many people with trekking experience will consider a guide/porter as they are cheaper. It should be noted these are trainee guides and may not have a lot of English. Don't forget to include your travel insurance in your budget. Panchase may be a short low altitude but I have seen several people slip and injure themselves on the stone steps. Here is my recommendation for travel insurance when in Nepal. Please note that prices here are rough estimates and do fluctuate depending on the time of year, weather conditions and political situations in Nepal. However they should give you a rough idea on budgeting your trek to Panchase. There is only one "official" trekking route on the Panchase trek. However over the years people and guides have "created" many more. The official route is relatively well marked while all others are not. The primary trail goes from Kande to Bhadaure. From Bhadaure you trek to Bhanjyang. 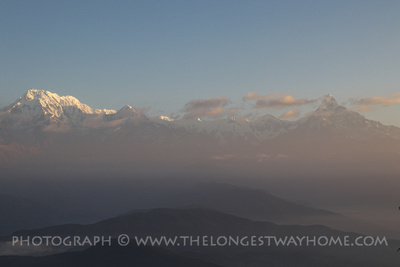 Then for sunrise your trek from Bhanjyang to Panchase Peak. After sunrise you return to Bhanjyang. You then have an option of spending the day resting in Bhanjyang or taking the 5+ hour trek back to Pokhara. To do this the easy way is to go back the way you came. The other way is to take a right at Happy Heart teahouse and trek down through farmlands and forest. Along the way passing the villages of Sidhane, Damdame and finally Ghatichhina where you can take a bus pack to Pokhara. This route takes your though forest areas, farmlands and small villages. It's a good idea to have plenty of water with you and snacks as there are no facilities on the way back using this route. Important: Many guides and guidebooks suggest the "World Peace Stupa" route back to Pokhara with a boat trip across Phewa lake. Unfortunately accidents have occurred along this route in the past. The area is forested and there are very few people around. Moreover there are not facilities at all along this route and the trail if overgrown. By taking the Kande to Panchase route and then Bhanjyang to Ghatichhina route you'll be doing a mini-loop of sorts. It's by far the most popular Panchase route to take. * Reducing or additional hours/days Some people decide to come back down to Pokhara on day two. Considering the 4am wake up for sunrise it's a long day but certainly possible. One option to extend the trek that is verifiable is to start from Pokhara to Australian Camp and then on to Kande the next day. There's no a huge benefit to this but the views from Australian camp are also nice. 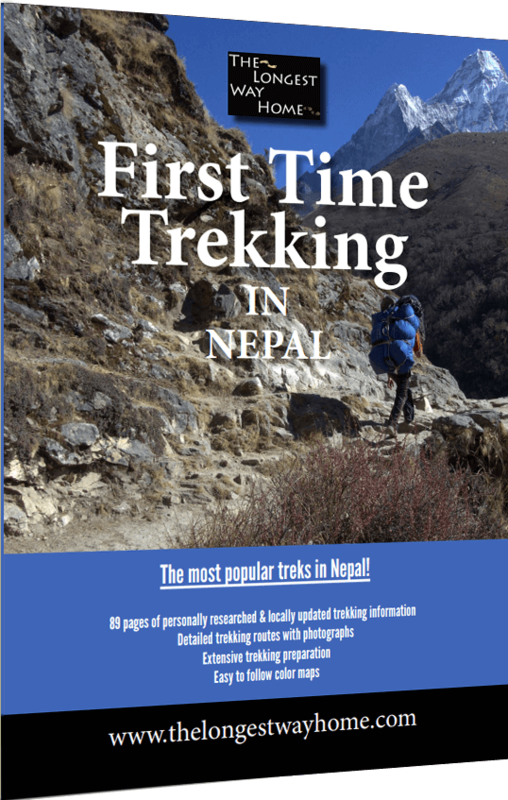 A fully detailed "trekthrough" trekking guide is available in both my Nepal guidebooks (print & digital) along with my First time trekking in Nepal guidebook below. Panchase Peak is one of many treks in Nepal. It's a relatively easy short trek with few crowds. Offering forest trails, teahouses, farmlands and an extensive mountain range view it makes for a very enjoyable trek. For alternative treks across Nepal do read my list of treks in Nepal which is continually being added to based on popularity or request. If you are looking for a trekking guide I recommend you read my article on How to find a trekking guide in Nepal. You may also contact me for details about the guide I had on this trek. However, I would prefer if you simply got my guidebook to Nepal which contains many local guides including my guides details. On the following pages below I've compiled detailed articles on the specifics of trekking in Nepal that may be of use to you. You will find them to be a great place to research your whole trekking trip to Nepal - be sure to bookmark them so you don't forget!